※　Prices include full day dive cruise, lunch, insurance and tax. 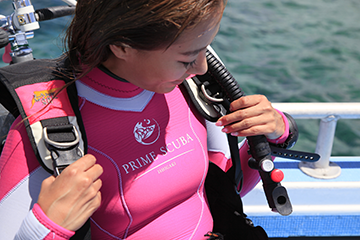 Rental gear is included in Refresh diving and Discover Scuba Diving programs. 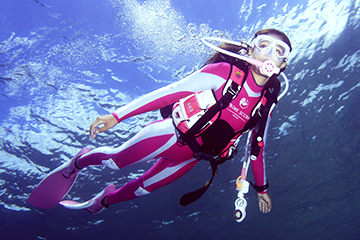 ※　Refresh diving program includes a brief review of basic diving skills in the Open Water Diver program. ※　10% discount is available for diver group of 5 or more during December thru March. ※　Prices include learning materials, full-day dive cruise, rental gear, lunch, PADI registration fee, insurance and tax. ※　OWD course does not include PADI e-Learning. Please make sure to complete e-Learning before the start of our program. 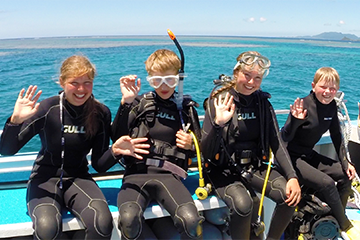 ※　If you will be joining our Fun Dives after the courses, all gear rental will be free. ※　Enriched Air Tanks need advance reservation. EAD specialty certification required. ※　Hood vest and boat coats are available for use on the boat. Please ask staff. ※　Prices include full day dive cruise, rental gears, PADI course fees, lunch, insurance, and tax. Plan 1 – Bring your own gear, and explore Ishigaki diving with Prime Scuba Ishigaki! If you are a certified diver and have your own gear, bring them with you, and explore Ishigaki diving on our luxury dive cruise! Plan 2 – Dive with our high quality rental gear and travel light! If you want to travel light, you can use our high quality rental gears and enjoy a stress free vacation. Plan 3 – Joining your non-certified partner? No problem! You are traveling with your family or friends and want to dive, but they are not certified divers.. No problem! We group our guests according their skill levels and requests, so you can enjoy our dive cruise with your family and friends!.